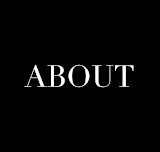 I myself welcome a hip, comfortable, capacious lounge on FDB and somewhere on Lenox and another on ACP Blvd. If done right, lounges would do well these days as many people entertain and casually meet with friends & acquaintances outside of their homes. Modern apts are too small for entertaining and even for casual meeting. Also, people today work such onerous schedules that make going home and preparing for such 'company' disagreable, not to mention the clean-up afterwards. When I got to Columbia in the late seventies the happening bar in that neighborhood was the Gold Rail. Such a great neighborhood spot==while this is clearly earlier, same vibe. "Money back on request" I like the sound of that whatever it is. The Baby Grand, The Silver Rail and the Palm Cafe were the hottest bars in the area. The Silver Rail went from a very popular Hetrosexual spot to what seemed like overnight it turned into a Homosexual spot which might have lead to its downfall. Well Sankofa, thats where you are wrong. 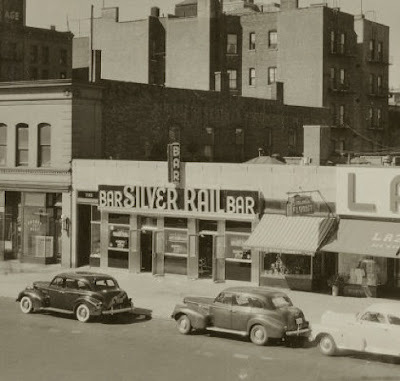 The Silver Rail became Andre's bar and yes it catered to the black gay crowd in Harlem and did exceptionally well. Also, another gay bar on 125th Street was known as Jay's and also did well and lets not forget the Big Apple on West 135th Street & ACP Blvd. All were around for significant amounts of time and did well. When white bars allowed blacks entrance in increasing numbers is why these bars met their demise and not because they catered to a predominantly homosexual clientele. Its my belief that Harlem could stand to have a new gay bar, somewhere on FDB or even on ACP Blvd. Gay bars in NYC whether predominantly white or black are doing poorly in NYC in general, but I think Harlem would prove to be the turn-around place for a gay bar. Well, thats where you are wrong Sankofa. Andre's filled-in where the Silver Rail left off and did very well. 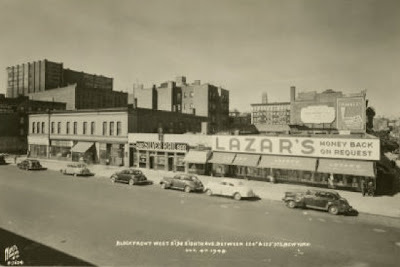 Another gay bar on 125th St. was known as Jay's and lets not forget the Big Apple. All three catered to a particular sub-set within the black gay culture of Harlem. the Big Apple catered to older, middle-aged gay black men while Andre's was known for its demi-monde and Jays catered to everyone else including hustlers. It is when down-town and Greenwich Village bars started to admit blacks including Keller's on West 72nd Street that you see the Harlem gay establishments downfall. It was economics and not because these venues catered to gays. In my opinion its time for Harlem to have another gay spot somewhere on Lenox, ACP or FDB Blvd. Also, we could stand to have a lesbian spot in Harlem as well, something we haven't had at all. There was a bar on 125th & Lexington called Boss Bar that lesbians frequented but not in large numbers. Anyway, I wish I had the capital cause I would definitely invest in the opening of a spot for gays in Harlem. While its debateable whether we are here now in increasing numbers as opposed to yesteryear or that our numbers are the same just that we are more out of the closet now, I think a gay bar or two would do well. I remember the Baby Grand very well. My parents had their wedding reception there as well as my fathers sister back in '62. I am from the Grant Projects in Harlem and there was also a bar called the Silver Rail which was on 125th and Amsterdam Avenue right across the street from Grant and I guess The Silver Rail closed down in the late 70's maybe as well as the Mid Way bar that was between 123rd and La Salle street on Amsterdam avenue. Before all the bars across 125th street started shutting down there were many that were pretty popular. The Top Club on St. Nicholas, The Baby Grand right across from it between st. Nicholas and 8th avenue. Then there was Charles Gallery next to the Baby Grand around the corner was the Spot Lite between 125th and 126th. Showmans took over Andre's and Showmans then moved over to Morning-side and St. Nicholas. Nat's was later changed to Nikis which lasted longer then them all was on st. Nicholas avenue between 124th and 125th street. Today there are no bars in that section of 125th. The only original still around today is The Lenox Lounge. My grandfather owned Andre's bar. His name was Andre Valdez. It was one of a few establishments he owned but this one, catering to a mostly black gay clientele, was revolutionary for its time. It's a direct predecessor to clubs like the Loft and Paradise Garage as it was one of the first to employ a DJ that blended songs into each other and extended 'break' portions that allowed songs to go on for what seemed like forever. I can still remember the music, energy and always happy patrons. I'm proud of his legacy. I met my first boy friend in Andre's. Were the two Silver Rail Bars owned by the same person? The one at 2165 8th ave and the one at 125 & Amsterdam. 2165 8th ave is around 116th but other places on the net have the Silver Rail aka Andre's between 124 & 125th....? Does anyone have an address for this alleged Jay's Bar that was supposed to be on 125th St. I can't find an address, picture...nothing. Thanks for help, I really do appreciate it.